The restaurant culture in Korea is a bit different from the typical Western restaurant. Here are some break down points that might help you on your next trip to order food! Did you know… that restaurants in Korea do not require tips? Also, the tax is included in the price already! So the price you see on the menu is what you pay at the cash register! So no need to bring extra money for tax and tips when eating out in Korea! 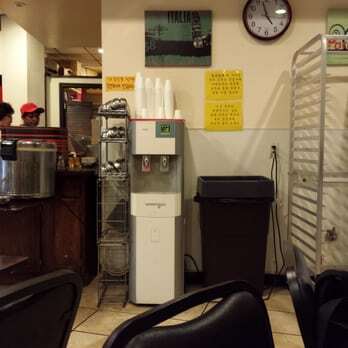 Did you know… that many (but not all) Korean restaurants have table “bells”? You can push this bell, usually located at the end of your table, to inform the restaurant staff that you need something, whether it be more yummy side dishes, some water, or if you want to order more food! Did you know… that there are also some restaurants that require that you take off your shoes? Korean traditional tables are low leveled, and one would sit on the floor instead of the typical chairs with high tables. There are some restaurants that have kept this tradition, and thus, require that you leave your shoes at the door! Sometimes, mats are provided for you to sit on, and also sometimes, slippers! Did you know… that many restaurants have “self-serve” sections? This applies for side dishes and water for the most part! Many restaurants and small eateries will have water dispensers, fountains, or refrigerators with containers filled with water that will be “self serve”, meaning that you get it yourself. More often than not, the cups used for water will be a metal plastic cup; if you see those, you know you are in the right place. Sometimes, side dishes are also self-serve! You will see a little section with side dishes and tongs with plates nearby where you can get what you want, and how much you want! If they have them, every restaurant will have different kinds of side dishes. Be careful though! Don’t get too much; restaurants often have fees that you have to pay if you leave any leftover side dishes! So get only what you can eat! Did you know… that many Korean restaurants have utensil on the tables? Quite a lot of restaurants in Korean have utensils at the table. They are usually in a wooden box on top of the table, or in a drawer on the side of the table! Make sure to double check and see if it’s there!